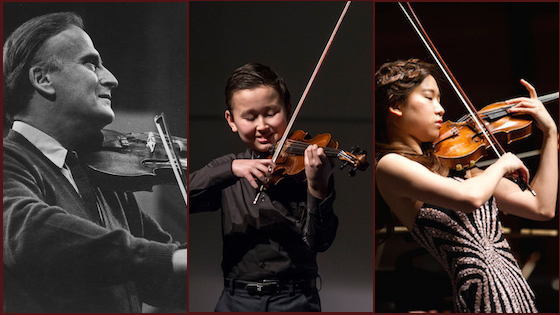 April 6, 2016, 8:29 PM · The Menuhin Competition begins Thursday in London at the Royal Academy of Music, with 44 young violinists from 20 countries around the world competing as part of an 11-day festival to celebrate the 100th anniversary of the birth of the famous violinist, Yehudi Menuhin. If you would like to see some of these performances over the next 11 days, competition rounds will be live-streamed beginning on Friday. Click here for the live stream. Rounds to be live-streamed include: First Rounds (April 8-11), Junior Semi-Finals (April 12), Senior Semi-Finals (April 13) and Junior Finals (April 15). Senior Finals will not be live-streamed. There will be an audience award for the Junior Finals, and voting will take place at the Idagio website. The Menuhin Competition begins with an opening concert Thursday night at Royal Festival Hall that includes previous prize winners Tasmin Little, Jiafeng Chen, Rennosuke Fukuda and Ray Chen performing with the Philharmonia Orchestra; Kazuki Yamada conducting. Other events such as concerts, lectures and master classes are listed here. Beginning Friday, the young violinists will compete in two divisions, the senior (ages 16-21) and junior (under 16) divisions, for a number of prizes, top among them being the Senior First Prize, £10,000 and a one-year loan of a golden-period Stradivarius sponsored by J&A Beare; and the Junior First Prize, £5,000 and a one-year loan of a fine old Italian violin sponsored by Florian Leonhard Fine Violins. The 2016 competition attracted a preponderance of females; 37 out of the 44 competitors are girls. The senior division includes only one male competitor. Merve Birbir, 18 (Turkey); Qing Yu Chen, 15 (USA); Yu-Ting Chen, 20 (Taiwan); Qing Yu Chen, 15 (USA); SongHa Choi, 16 (South Korea); Asako Fukuda, 19 (Japan); Molin Han, 15 (China); Ziyu He, 16 (China) (the only male); Ariel Horowitz, 19 (USA); Do Gyung (Anna) Im, 18 (South Korea); Yookyung Kang, 19 (South Korea); Jeein Kim, 20 (South Korea); Marie Isabel Kropfitsch, 19 (Austria); Nan Joo Lee, 20 (South Korea); Yoojin Lee, 17 (South Korea); Youjin Lee, 20 (South Korea); HyunJae Lim, 18 (South Korea); Mathilde Milwidsky, 21 (UK); Juliette Roos, 20 (UK); Louisa Staples, 16 (UK); Kelly Talim, 20 (USA); Belle Ting, 15 (Taiwan/Canada): Eva Zavaro, 20 (France). Olivia Chen, 14 (USA); Elli Choi, 14 (USA); Alexandra Cooreman, 13 (Belgium/Poland); Johan Dalene, 15 (Sweden); Marley Erickson, 12 (USA); Kristina Georgieva, 15 (Bulgaria); Klara Gronet, 15 (Poland); Ria Honda, 15 (Japan); Antoni Ingielewicz, 14 (Poland); Yeyeong Jin, 12 (South Korea); NaKyung Kang, 12 (South Korea); Byeol Kim, 15 (South Korea); Anne Luisa Kramb, 15 (Germany); EunSeo Lee, 14 (South Korea); Yesong Sophie Lee, 12 (USA); Hina Maeda, 13 (Japan); Kevin Miura, 13 (USA/Japan); Mahiru Moriyama, 15 (Japan); Michael Rosborg Germer, 13 (Denmark); Takumi Taguchi, 14 (USA/Japan); Samuel Tan, 10 (Singapore); Coco Tomita, 14 (Japan). Click here for full bios of the competitors. It's the first time that the competition has been held in London since 2004; the competition in 2014 was held at Butler School of Music at the University of Texas, U.S.; in 2012 at the Central Conservatory of Music in Beijing; in 2010 at Norwegian Academy of Music in Oslo; and in 2008 at the Royal Welsh College of Music in Cardiff. The Menuhin Competition was founded in 1983 by the violinist and humanitarian Yehudi Menuhin. First-prize laureates in the 2014 competition were Stephen Waarts of the U.S. in the Senior Division and Rennosuke Fukuda of Japan in the Junior Division. Among the previous laureates are: Ray Chen (2008); Simone Lamsma (2002); Feng Ning (2000); Julia Fischer (1995); Tasmin Little (1985) and many more.